Growing up one of my favorite soups was Sopa de Agrioes or Watercress Soup. It's so delicious and filling and again I have wonderful memories of my greatgrandmother preparing it in the kitchen, she would let me help her and I thought that was the best thing on earth......I must have started showing interest in cooking at around 5 or 6 years old. Anyway, she taught me my love for food and I love her for it. Bring a pot of water with the salt, to a boil....in the meantime wash, peel and cut into small pieces the onions, potatoes and leeks. As soon as the water is boiling, add the onions, potatoes and leeks and let them cook well. When they're cooked and are at the stage where they're almost falling apart, you drizzle with olive oil and then using a hand blender, blend everything well. In the meantime, wash the watercress, separate the little leaves. Let the soup come to a boil and then add in the watercress letting them simmer over low heat. 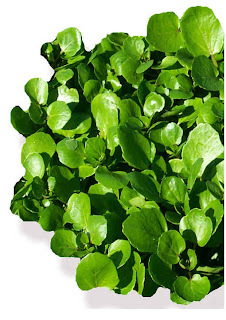 Hint: You can substitute the watercress for spinach or any other green, I just prefer the watercress. This is one of those portuguese side dishes that I love preparing when we eat Steak. I remember back home we would have a big juicy portuguese steak, homemade fries and Esparregado. 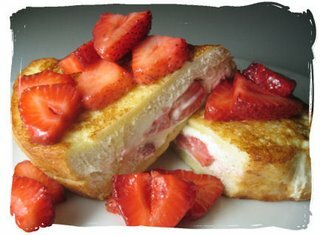 My kids LOVE it and my husband requests it often, it's so so easy to make and truly delicious. In a skillet, add olive oil and garlic, drop in the spinach and cook for about 2 to 3 minutes. Next add the flour and mix well, slowly stir in milk and continue stirring until you achieve a creamy consistency. Season with salt and pepper and VOILA! Yummy spinach side dish that everyone will love. Curt and I are trying to eat healthier and we've started ordering the salads from the fast food places but they're expensive and not really good on the budget. One of our favorites are the Crispy Chicken Salads with Honey Mustard dressing, so I decided to try making it at home and was very impressed with the results, it's SO much cheaper than buying it and I can make it whenever I'm in the mood....makes a great lunch. In a bowl combine the first 6 ingredients, I like my lettuce to have big pieces so I don't chop it up, I just wrip the leaves into big chunks. I do cut the bigger popcorn chicken into smaller bite size pieces. In a small bowl, combine mustard and honey....I eyeball it and just keep adding the two and stirring them up until I'm happy with the taste. You want it to be sweet but still have that kick from the mustard. Pour over lettuce and chicken, combine well and serve. What I love about this recipe is that I can make it just for myself or I can double it for the whole family or a potluck. 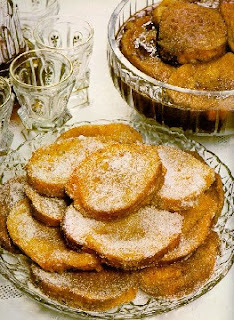 One of the ways we use day old bread is to make these wonderful "Fatias Douradas" or Golden Bread Slices. They're SO good and I remember my greatgrandmother making them for Christmas or on other special occasions. Beat the eggs with the flour and add slowly 1/2 of the milk. In a separate bowl deep the slices of bread and after deep into the egg mixture. Fry in hot oil covering it afterwards with a misture of sugar and cinnamon. This is one of my favorite ways to prepare cod fish. Cook the cod, if using salt code then remember to soak it for 24 hours previously to making this dish. Fry the potatoes, just until tender then add the margarina or butter and flour and cook stirring constantly. Add the milk, heavy cream, salt and pepper to taste. Fry the onion in a little bit of olive oil, just until transparent. 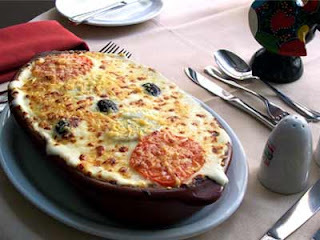 In an oven proof dish place the slightly fried onion, the cod and then the fried potatoes, topping with shredded cheese. Place in the oven until golden brown. About 375º F for about 20 minutes or so. I LOVE Acorda and it's one of those dishes that you can have either as a soup on it's own or as a side dish for fish fillets. There's different Acorda's as well, there's Acorda de Alho (Garlic Breaded Soup) and Acorda de Tomate (Tomato Breaded Soup). Peal the garlic, cut inpieces and smash with the coriander, olive oil. Put in bowls covering with the bread cut in pieces. Boil the desired amount of water with salt to taste and a spoonful of vinegar. Break the eggs slowly into the boiling water until slightly cooked. Take the eggs and place in each bowl with the broth on top. You may use water the cooked codfish and proceed the same way. It makes a delicious soup. For some reason Blogger is not cooperating and not showing the MPM banner or any other pic...sorry about that. 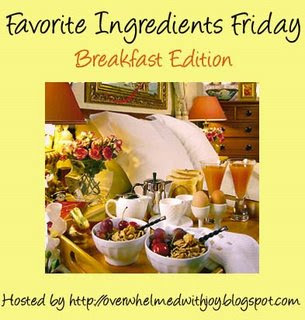 I'll be posting the recipes for some of the dinners throughout the day. 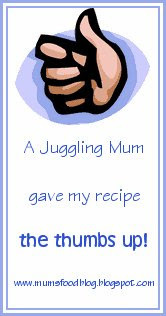 YAY I got a thumbs up for this recipe that I posted on one of my Slow Cooking Thursdays.....isn't it great when someone tries a recipe and enjoys it??? 1. Put the chicken in the slow cooker. Top with the spaghetti sauce, green bell peppers, mushrooms, onion, and garlic. 2. Cover, and cook on Low for 7 to 9 hours. I made this for dinner tonight and everyone enjoyed it, it's actually pretty good, it's crispy and still juicy and tender inside. Preheat oven to 400ºF. 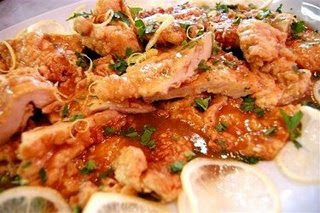 Coat chicken with coating mix as directed on package; place in greased 13x9-inch baking dish. Discard any remaining coating mix. Bake 20 min. or until chicken is cooked through. Beat soup and milk with wire whisk until blended. Pour evenly over chicken; sprinkle with cheese. Bake an additional 5 min. or until cheese is melted and sauce is bubbly. Serve with rice or mashed potatoes. 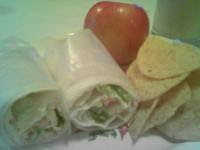 Since summer has started and a lot of us will start going on picnics, I thought I would share some picnic recipes, enjoy! Preheat oven to 350 degrees. Place butter in a 9X13 baking pan. Melt in oven. Remove pan from oven and carefully tilt pan to spread melted butter around. 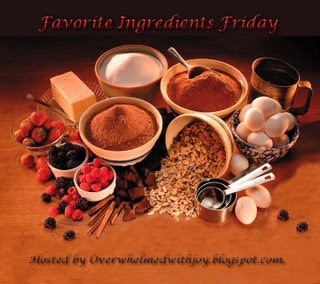 Sprinkle graham cracker crumbs over melted butter. Pour sweetened condensed milk over the crumbs. Top with remaining ingredients. Bake 25 minutes. Cool. Cut into bars. This is dinner tonight and I admit I've never tried it before so I can't give you a thumbs up or down for that matter. I'll let you know if we like it and how it turns out. Heat oven to 350ºF. In a bowl, combine spinach, turkey, spreadable cheese and red peppers. On lightly floured surface, press dough into 9" x 12" rectangle. Spread spinach-turkey mixture over dough, leaving 1" border. Starting at long end, roll dough jelly-roll style, folding in sides. Pinch ends together to seal. 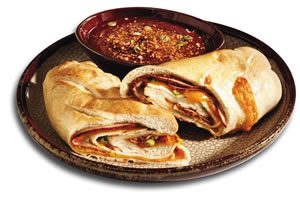 Place stromboli seam side down on foil-lined baking sheet coated with cooking spray. Using scissors, cut deep Vs on top to release steam. Bake 1 hr., 10 min., or until golden brown. Let stromboli sit 5 min. before slicing and serving. I came across this recipe in a magazine a while ago, I planned on making it last summer and completely forgot about it, but while organizing my recipe collection today I found it again. Instead of just putting it aside, I decided to get right in there and make it. It's a HIT and it's soooooo good, you have GOT to try it. Prepare pudding mix with milk according to package directions for pie filling consistency. Let prepared pudding stand 5 minutes. Fold in bananas. Let stand for 10 minutes. Arrange 10 Twinkies in bottom of 9" springform pan, cutting to fit. Spread with pudding mixture. Top with remaining Twinkies. Spread with 1 cup topping. Cover; refrigerate at least 4 hours or overnight. Uncover. Remove side of pan. Spread top and side of cake with remaining topping. Press 1 2/3 cups toasted coconut onto side of frosted cake. Drizzle with 2 Tbs. Caramel sundae topping. 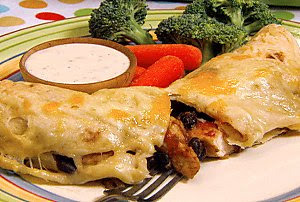 Chicken and Black Bean Enchiladas! This is what we had for dinner last night, I made some Spanish rice as a side dish and we're good to go. The enchiladas were pretty good, I think I would probably add a little more salsa to them and even some cheese to the filling too....other than that they were delicious. Recipe from Robin Miller on Food Network. *Cook's note: this is enough chicken to make this meal and another meal. If you are only making this meal, use 1 pound chicken. Heat oil in a large skillet over medium heat. Add onion and garlic and saute 2 minutes. Add chicken and saute 5 minutes, until golden brown and cooked through. Remove half of the chicken and reserve for another use. Arrange 4 tortillas on a flat surface. Top each tortilla with an equal amount of chicken mixture. Roll up tortillas and place side by side in a shallow baking dish. Top tortillas with shredded cheese (1/3 cup per tortilla). Bake enchiladas 15 minutes, until cheese is golden and gooey!